South Africa – Spot wildlife from your private deck and venture out on game drives in search of the Big Five. Tanzania – See Africa from above on a hot air balloon safari and luxuriate on the island paradise of Zanzibar. Zambia – Explore the magnificent Victoria Falls, one of the Seven Natural Wonders of the world. Namibia – Stargaze among the enormous sand dunes of an ancient desert. Arrive in O.R. Tambo International Airport in Johannesburg, the largest city in South Africa. 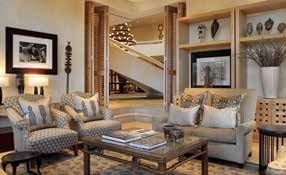 You will be met with VIP Fast Track service and transferred to your Luxury Suite at the splendid Saxon Hotel. Meet your travel companions and Lakani Tour Managers at a welcome cocktail reception and dinner party. Board the Lakani Private Jet this morning and fly to Windhoek, capital of Namibia. There you will transfer to a private charter flight bound for Sossusvlei in the Namib Desert. Gaze at the large red dunes, some of the highest in the world, that surrounds the salt and clay pan in the Namib-Naukluft National Park. You’ll see them from your luxury accommodations at the newly renovated lodge. Explore the area on guided walks, nature drives, and by quad-bikes. View San rock paintings and petrified dunes. Discover Sesriem Canyon and Dead Vlei on excursions. Float above the spectacular dunes in various hues from orange to terra cotta that tower over the vast, dry pan. Join the resident astronomer for an evening of unforgettable stargazing at the state-of-the-art observatory. Transfer to Windhoek by charter flight and board the Lakani Private Jet bound for Zambia. 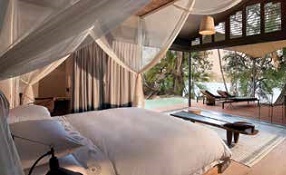 Settle in your luxury tent overlooking the Zambezi River. 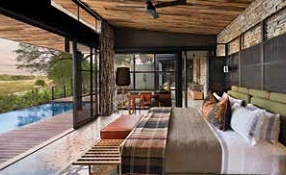 Take a dip in your private plunge pool, watch for hippos in the river, and perhaps indulge in a spa treatment. Take a morning guided walking tour of the majestic Victoria Falls, followed by lunch at the Royal Livingstone Hotel with a special guest. View the falls by helicopter on a scenic flight over the Zambezi River and National Park. See the beautiful African sunset aboard a private cocktail cruise on the Zambezi. 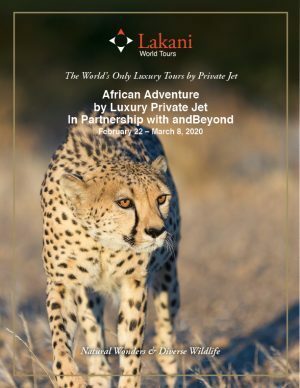 Fly aboard the Lakani Private Jet to Kilimanjaro and transfer to a private charter to take you to the Serengeti and your tented camp. Become at one with nature on exciting wildlife drives in the morning and late afternoon. Spot the Big Five and seek out the wildebeest calves; during this time of the year thousands may be born on the same day! Observe the animals as you soar over the Serengeti in a beautiful balloon. Spend the whole day on safari with a picnic lunch, if you choose. Relax by the campfire with Sundowners in the evening and recount your adventures with fellow travelers. Take a private charter flight back to Kilimanjaro where your Lakani Private Jet awaits to carry you to Zanzibar, the archipelago off the coast of Tanzania in the Indian Ocean. Visit the historic center of Stone Town, a UNESCO World Heritage Site on the main island of Zanzibar. Travel by road and boat to your island paradise on Mnemba. You may be as active as you choose during your time here. Swim, snorkel, dive or participate in a wide variety of water sports. Spot the island’s wildlife, such as Ader’s duiker, Suni antelope, an assortment of birdlife and dolphins. Perhaps indulge in a massage, or simply relax by the pool with a book. As the sun sets, climb aboard a traditional dhow for a sundowner cruise. Bid farewell to your idyllic island resort and return to the airport and board the Lakani Private Jet for your final flight to Skukuza Airport in Kruger National Park. Spot wildlife on your way to your safari haven located on the Sand River. Seek out the elusive leopard, lions, spotted hyena, elephant, white rhino, buffalo, hippo and much more on your twice daily game drives and bush walks. From the river-facing private deck of your suite, you’ll have opportunities for wildlife viewing as they come to water to drink. Take a dip in your private pool to cool off after your safari drive, or perhaps indulge in a spa treatment. Join your fellow travelers for sundowners and share your unforgettable moments from this memorable journey. 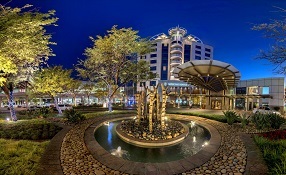 Board the private charter flight bound for Johannesburg where you’ll be met and escorted over to the Inter-Continental Hotel where you will have an opportunity to refresh and repack in your reserved room. You’ll have the rest of the day at leisure before your evening departure flight transports you home or to your next destination. Settle in your elegant and spacious Luxury Suite in the prestigious hotel situated on ten acres of gardens. Enjoy 24-hour butler service, an array of welcome amenities, and absolute comfort in your beautiful suite that is decorated in contemporary African style. Visit the Spa for a rejuvenating treatment to help you recover from your international flight. 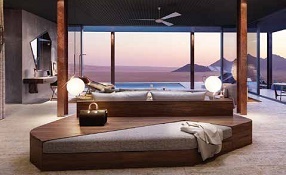 Escape from daily stress and reconnect with nature in your newly refurbished, air-conditioned Suite with unforgettable floor to ceiling views of the surrounding mountains and sand dunes of the Namib Desert. After a day of exploring the desert on nature drives and walks, take a dip in the pool. In the evening, join the resident astronomer for an in-depth look at the amazing African sky. Immerse yourself in life along the Zambezi River in your luxurious Tented Suite with close-up views of the famous river where you are sure to spot pods of Hippos. Featuring an array of amenities, your tent includes a private plunge pool. Catch up on your reading in the lodge’s library, take a dip in the infinity pool, or enjoy a spa treatment while looking out onto magnificent river views. Gather with fellow travelers at the sunken boma on the main deck for cocktails and watch the sun go down. Experience the ultimate in luxury camping, complete with private butler service in the heart of the Serengeti. 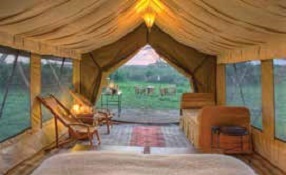 Your luxury Tent offers hot bucket showers, flush toilet, and comfortable beds with fluffy duvets. Carefully positioned for proximity to the wildlife of the Great Migration, the mobile camp affords you optimal viewing opportunities of the wildebeest calving season at this time of year. Luxuriate in paradise in your beachside Banda overlooking the Mnemba atoll. 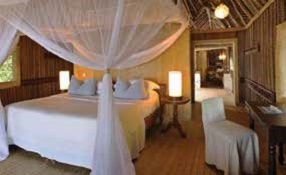 Your open-sided, thatched wooden suite has rattan floors, fans for cooling, and your own private shaded veranda. Snorkel, swim, kayak, scuba-dive, or simply unwind and take in the idyllic scenery from your private island hideaway. Delight in abundant fresh fruit and seafood, along with delicious mezze. Enjoy candlelit dinners on the beach, or on your veranda. Indulge in safari luxury at this brand new andBeyond lodge, in your secluded and spacious Suite with sweeping views of the Sand River, where you may spot animals drinking and cooling off. The décor celebrates custom-made furniture and artwork of local designers and artists. Step out onto your private deck where you’ll find your own swimming pool. After seeking the Big Five on your evening game drive, return to a gourmet meal paired with beautiful South African wines. Simply, unforgettable! The perfect room to refresh, repack, and relax before your evening departure flight.